I weighed-in at a new low of 79.2 kg this morning, which is about a 1.0 kg loss after eating a pound of bread a day for three weeks. So I’ve lost about 50g of body fat a day, which is all I can ask for without restricting my calories. I bought another 610g of bread this morning, including a walnut raisin petit loaf, which I’ll eat with butter. I’ll use a sourdough baguette to make lamb burgers, and to snack on with butter. 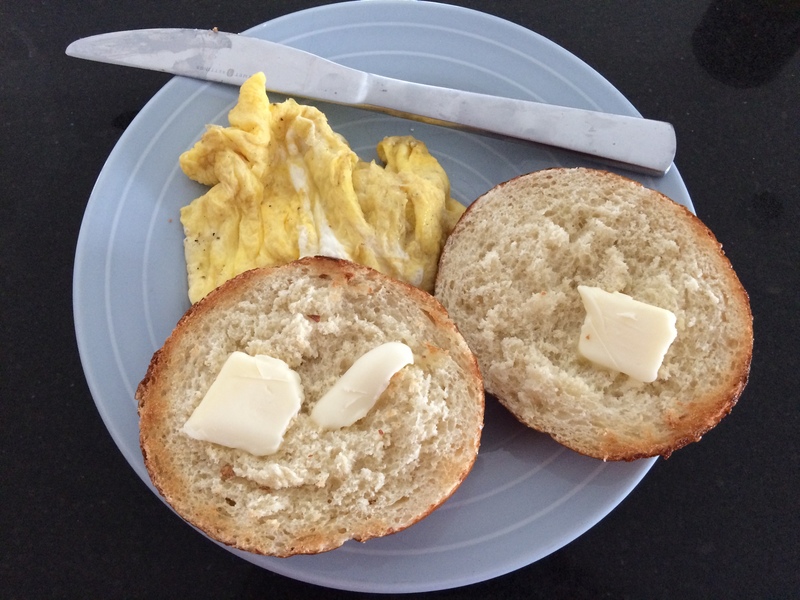 I had a pretzel roll with butter and scrambled eggs for breakfast. Otherwise, I’ll fill out my meals with veggies, which provide the key fiber, micronutrients, antioxidants, etc. that really make us healthy. It’s kind of fun to tell people that I’m eating a pound of bread a day. It sounds particularly crazy since I’m trying to lose weight. And I didn’t know how the experiment would turn out. We’re all so terrified of bread, that I wouldn’t have been surprised by a weight gain. But after the fact, it’s “obvious” that bread is only calories, you can still lose weight if you burn them off. The bottom line is that there’s not that many calories in a pound of bread. Breads usually have around 2.75 calories/g, so a 454g loaf has about 1250 calories. That’s not even half of what an active male burns every day. Instead, we should ask ourselves why we’re so terrified of bread. I remember back in the early 2000’s, when the Atkins craze was in full swing, and people were sure that potatoes and rice made us fat. Well, at least they were convinced that excluding all carbs from your diet would result in fast and rapid weight loss. Of course, no one could really comply with a low-carb (< 50g/day) diet, but everyone ended up believing that "carbs make you fat". Which is where we are now, except that you can eat some tubers in a Paleo diet. In my day, no one had a gluten sensitivity. Back then, everyone was lactose intolerant. Now, sadly, no one is. And what happened to oat bran?